Sorry if we missed you! This event has already happened. 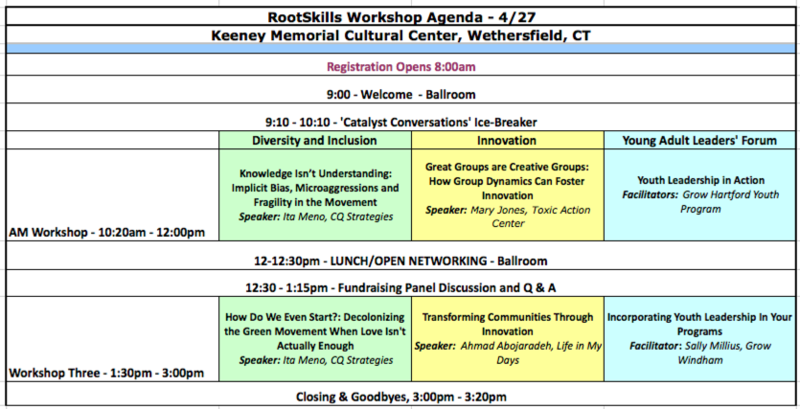 Grassroots Fund grantees, community organizers, nonprofit leaders, and passionate students came together on April 27, 2018, at the Keeney Memorial Cultural Center (Wethersfield, CT) for a RootSkills In-Person Training. This event was part of the Grassroots Fund's 2018 Environmental Justice Month. We welcomed participants to learn, share, & work together to develop actionable, holistic strategies that aim to create more inclusive communities & programs. At this event, we grappled with tough questions and shared inspiring solutions. The April training was comprised of three tracks: Equity & Inclusion and Innovation (each with two workshops throughout the day) and Young Adult Leaders Forum (a full day track). Additionally, the morning welcome included Catalyst Conversation ice-breakers to get juices flowing and facilitate new connections. Our lunch-time session provided time for open networking and a fundraising panel. Further session details and descriptions are available below.